Video games are the best form of artwork there is, because the unique aspects of the form create for interesting works. Like, Milkmaid of the Milky Way ($3.99). It’s a point-and-click puzzle adventure by solo developer Mattis Folkstead that pays homages to the initial heyday of the genre in the 1990s. And he does so in a game about a milkmaid in 1920s Norway that has to save her cows from aliens. While all the dialogue is written in rhyme. Oh, and the story has a certain melancholy to the whole affair, about time passing and losing loved ones. Also, you ride a hoverbike. Milkmaid of the Milky Way is a unique affair. The setup of Milkmaid of the Milky Way is that you control Ruth, a young woman from 1920s Norway. She’s running the last vestiges of the family farm after the disappearance of her mother and death of her father. It’s just her, and the four cows, as she makes butter and cheese to sell. But the people are starting to eat more margarine, so business isn’t looking great. Ruth finds herself wondering if there’s a life beyond the farm and the memories there. Then her dang cows get abducted by a weird spaceship and it’s up to Ruth to find a way on board, and save them from a tyrannical queen who steals the youth from her subjects and turns them all into old geezers. Yeah, the story takes a turn. Point-and-click adventures, aren’t they the best? The most obvious hook to Milkmaid of the Milky Way is that all the dialogue in the game is rhyming. Every piece of dialogue rhymes. Generally it’s an AABB rhyming structure, but the game throws a an occasional ABAB rhyming structure your way. The rhyming works quite well, and forms a key part of the game’s personality. I mean, they do rhyme “anything" with “thing" at one point, but look, you try writing hundreds of rhyming couplets, including meaningless throwaway dialogue, and try to get it perfect. It’s a monumental challenge, and one that the dev nailed quite well. The story is rather charming, especially as you meet the alien inhabitants (and a saucy pair of old ladies). Yet, not all is comical here: this is a game where there’s a sense of melancholy and loss throughout the entire story. And the ending isn’t necessarily happy ever after, with one particular dangling thread that I wonder was just abandoned or perhaps left for a future title? The story that is here is done well. 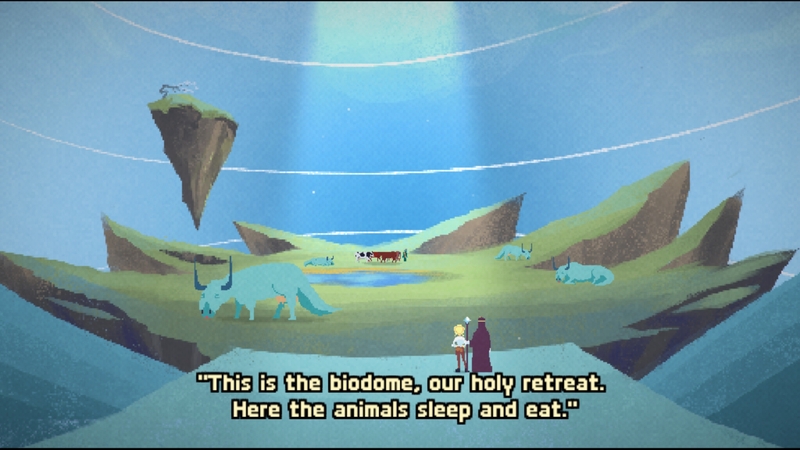 Considering that this is basically a game where cows getting abudcted by a UFO is the action that drives the story along, there’s a great job put into characterization. The emotional moments of the story are delivered with the necessary gravitas. The quest of a milkmaid saving her four cows is given the emotional weight necessary to justify the whole experience. Visually, Milkmaid of the Milky Way looks quite gorgeous. It’s a curious mixture between low-resolution, old-school pixel art, but with some surprisingly detailed backgrounds and scenery. It’s a contrast that works well as an aesthetic. The nature portion of the game has certain alien elements to it that feel forboding while still natural. The color choices – in particular the use of light shades of blue – helps provide the scenery and mood for the game. The story feels kind of blue at the end of it all. The soundtrack is quite engaging to listen to, with a vibe that manages to transition from feeling down-home and natural, to picking up a space-y, prog-rock vibe as things get weird. Artistically, this game is a fantastic experience. 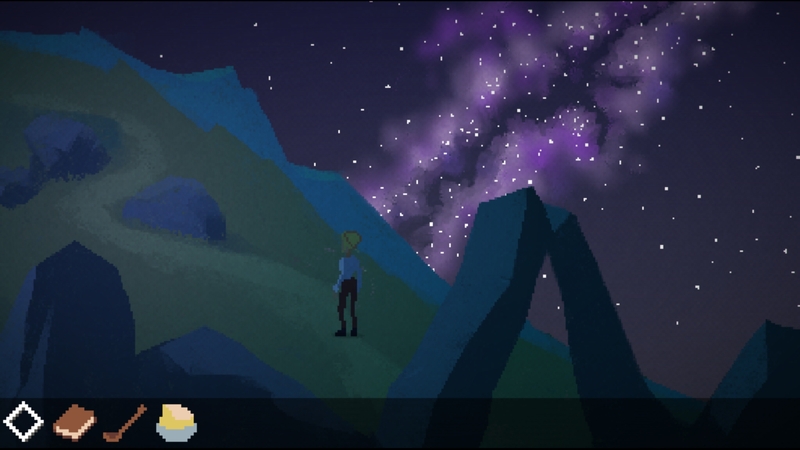 Milkmaid of the Milky Way subscribes to the ethos of being a streamlined, failure-free point-and-click adventure. There’s no fail state, and your item usage is limited to using on certain characters and scenery. There’s no arcane combinations to be had here. There aren’t any hints, and no way to see all interaction points on screen, but I wouldn’t say those are quite necessary to beat the game. I felt mildly stuck at times – and one puzzle near the end of the game was confusing me for a bit – but nothing that I couldn’t figure out through revisiting locations and just trying things out as necessary. This does mean that the experience is kind of just a nice ride through a couple hours of play. You never really have to worry about failure. But sometimes the best games throw a little bit of resistance at you, and admittedly this is just a relaxing, sit-back experience to take in. Maybe that’s something that’s perfect for you – I like it from time to time, myself – but I could see where people who prefer a game that puzzles them, challenges them, and maybe the more straightforward and linear Milkmaid of the Milky Way might not hold much for this crowd. It’s an intersting story and experience, but might not be ideal for a certain portion of the audience that likes getting stuck in something like Day of the Tentacle ($4.99), for example. One aspect that I like of Milkmaid of the Milky Way is that the game autosaves quite often, while also offering manual save slots, that all show date and time. It’s how a save system should work, ideally. 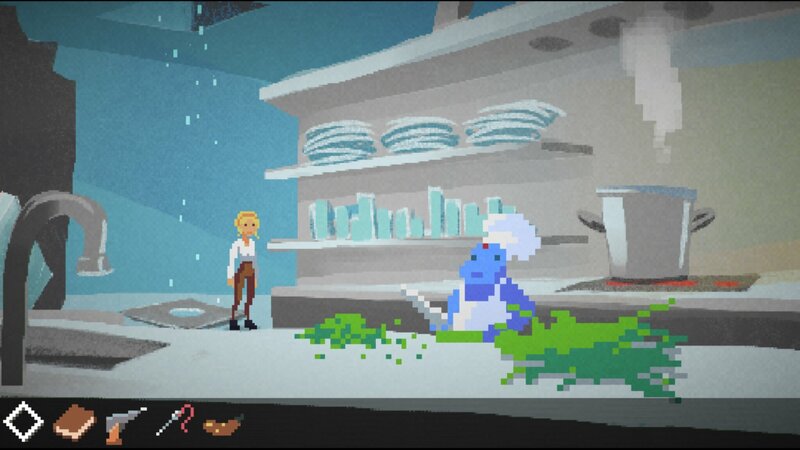 If you want to spend a little bit of time in an interesting world, play Milkmaid of the Milky Way. Developer Mattis Folkestad has put forth a tremendous solo effort here into a charming game that’s worth your time.